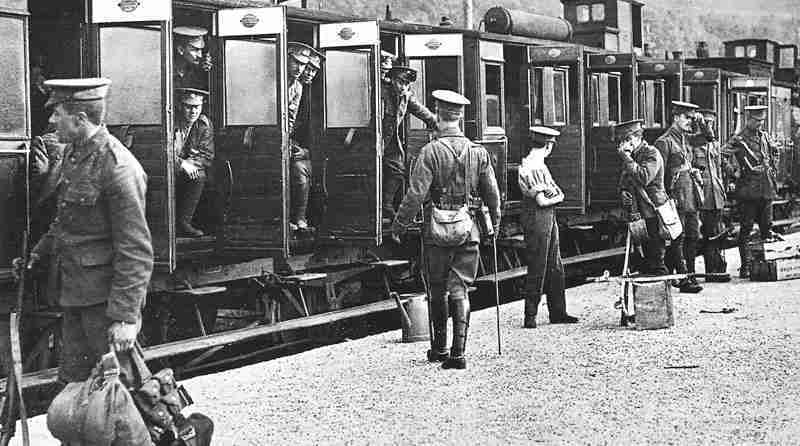 Troops of the BEF entrain for the Western Front. France: LANDING OF THE BEF. British I and II Corps land at Le Havre and Boulogne (complete on August 17). After the French have taking Mulhouse and following 15-mile advance and sharp engagement at Cernay with superior German XIV and XV Corps, Bonneau retreats to avoid encirclement. Belgium: French cavalry enters Belgium. Morocco: French including Foreign Legion 1st Regiment repulse tribal attack on Taza, east of Fez. North Sea: First decisive surface ship-submarine action on high seas. Surfaced for engine repair, German U-15 is rammed and sunk by cruiser ‘Birmingham’; no survivors. French Army airship ‘Fleurus’ flies reconnaissance mission over Trier. Austria-Hungary: Government declares war on Montenegro. Belgium: German peace terms to Belgium via Holland rejected. But Belgium proposes ‘African free trade zone’, which Germany agrees via Spain on August 22. War Minister Falkenhayn agrees to War Ministry Raw Materials Section headed by Jewish civilian Rathenau, which begins to work on August 28.